The media does a pretty wonderful job of reporting every horrific crime that occurs in Chicago, and I am not here to say that is wrong. It is important for people to be knowledgeable of the events occurring in this city and to be aware of what is going on. I feel safe saying that one of the first things that might pop into your head when you hear the word “Chicago”, may be one of the following: violence, war zone, crime, fraud, gangs, drugs or maybe in some cases…pizza? With that being said, Chicago has a reputation. I think we can all agree upon that. As important as it is to know of the harmful events that occur, it is also important to be aware of the good that goes on. The media may be quick to provide one viewpoint, but remember that there is normally a different narrative not being presented. Since moving to Chicago, I have been amazed by how God is working in this city. Through communities, social services, businesses, and grade schools, along with many other areas. 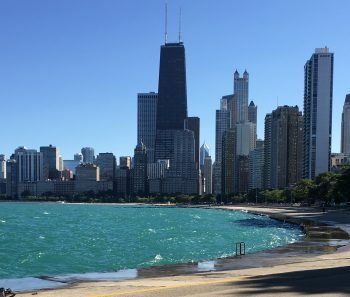 Before moving here I was narrow minded in my idea of what Chicago was like and my hope is that you consider of the other side of what the media does not tell. I want to take some time to share the good work God is doing to transform Chicago. I am currently working at a charter school (Moving Everest) and a non-profit (By The Hand) in the Austin neighborhood of Chicago, located on the South West side. Austin is a hurting neighborhood, but God is at work in this community. In 2013 Chicago Public Schools gave a grant to open Moving Everest Charter School. Our mission is that every child deserves the right to a proper education. Today, 270 children from Austin and neighboring areas are now receiving an outstanding education. When CPS gave the grant, By The Hand was asked to become the after-school program for the school, making this By The Hand’s second location in Austin. By The Hand now has five locations in Chicago’s most under-resourced neighborhoods. They are an after school program that takes children by the hand and walks with them through life. They focus on sharing God’s love to these children, bringing them abundant life: mind, body and soul. I am so blessed to work at both of these organizations that are transforming the neighborhoods in Chicago that many others have viewed as hopeless. Now you may not hear about both of these organizations on the news, or any of the other hundreds of organizations that are making positive changes in Chicago. What I want you to know is that everything the media reports on Chicago is real and it is a hurting city, but there is another narrative not presented. There are outstanding organizations with individuals that work day in and day out on decreasing crime, violence, drugs, and improving education. Chicago is not a lost cause. God is working in this City and I get to experience his work every day that I go into work. Natalie Moore, a journalist on Chicago’s south side stated in a recent piece, “When we adopt war metaphors to characterize how we live in our communities, we put a ceiling on our imaginations for how we might address violence and harm”. Let that sink in and don’t forget about all the good that goes on in this beautiful city everyday.